Dr. Nick Szopinski grew up in Joliet, Illinois. He was introduced to chiropractic care at a young age by his parents. His family utilized a great chiropractor in his hometown, and realized that the benefits they were receiving could also echo into his life. As Dr. Nick experienced care, he saw improvements in his posture, as well as great support for the various sports that he played. As he learned more about the profession, he knew he had to make it his own. Thanks to his experience as a patient, Dr. Nick knew he wanted to go into natural medicine for a career. After high school Dr. Nick attended Western Kentucky University studying biology. He then pursued a higher education at Palmer College of Chiropractic, graduating in 2015. With external studies, Dr. Nick is qualified in soft tissue work, body bio mechanics, and pediatric care. For Dr. Nick, chiropractic care creates an opportunity for his patients to improve their health naturally. 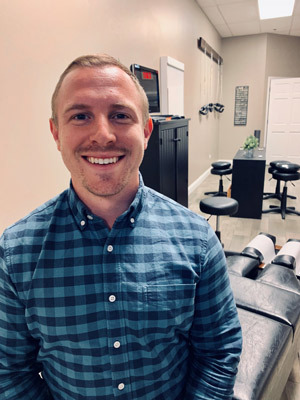 He appreciates many aspects of being a chiropractor, but ultimately he focuses on helping his patients achieve their goals inside and out of the office, and supporting them to do what they need to do and want to do in their lives. Dr. Nick also loves working with a wide selection of people. His patients are all different ages and come from all different backgrounds. Dr. Nick truly cherishes the diversity that his profession brings to him. Outside of work, Dr. Nick spends his time outdoors, hiking and fishing. He also enjoys going new places and doing new things with his girlfriend and their dogs. Dr. Nick also enjoys playing rugby, he has been playing for 6 years starting in chiropractic school.